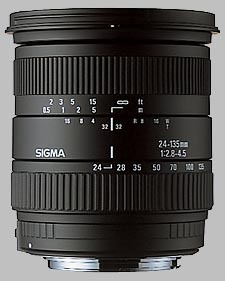 (From Sigma lens literature) This highly versatile lens can be zoomed from ultra wide angle to telephoto in a split second and will enable you to compose and capture the most demanding of subjects from a static position. The lens offers a large aperture of f/2.8 at 24mm. It performs superbly even in relatively low light conditions indoors or at dusk. The large aperture helps eliminate blurred images due to camera shake. The Special Low Dispersion (SLD) glass element and two Aspherical Lenses provide a high level of optical performance and excellent correction of all types of aberration, while making very compact and lightweight construction possible. The inner focus system provides high performance throughout the zoom range. As the front of the lens does not rotate, polarizing filters and Petal-type hoods can easily be used. I've seen many reviews on this lens both for and against it. I needed/wanted a lens with its range for my Konica-Minolta Maxxum 5D. It was either get the Minolta 24-105 f3.5-4.5 or this one. I choose this one and I'm glad I did. It rivals the Minolta lens well equaling it if not bettering it. It is definitely an under rated lens. The www.popphoto.com review of this lens gave it excellent imatest results for sharpness. However, they claimed it had in the range of 2.4% barrel distortion at the 24mm end which I do not see at all. Granted that I use a camera with an APS-C size sensor, but the distortion would nonethless have to show a bit regardless. I do not see any of it. Pop-Photo claims it to be a great general purpose lens. I think it is more than that. It covers a lot of range and is a great walk around lens as well as a good portrait lens. Though it is not a macro lens I have used it in such a way and I have gotten great results. But, if you are a macro shooter get a dedicated lens. Though, this lens comes in handy for such a job if you happen to not have a macro lens with you. The colors are good if not great. The build of the lens is excellent. It feels heavy and substantial. I rated its build a 9 for one simple reason: the rubber on the zoom ring began slipping. So, before it could stretch out and deform I used a good grade of double sided sticky tape to repair the problem. It worked great and I have had no problems since. The zoom ring is pretty well dampened, but it is a bit uneven in feel when comparing zooming out and in. The manual focus ring is fine and has a good feel to it. It does rotate during auto focus. However, it is out of your way. It is plenty bright (f2.8-4.5). It focuses fast and if it hunts it is in the lowest light with a complete lack of contrast. Any lens will have that problem. It controls CA really well. It is also sufficiantly sharp throughout its range. A touch soft on the 135mm end as well as wide open throughout the range, but not much loss that unmask sharp in Photoshop can't help with. No zoom lock is necessary as this lens does not creep in the retracted (24mm) position. Though, it might have been a nice feature to have. I have to add that it does not match my Minolta AF 50mm f1.7 prime lens in sharpness wide open (at 50mm and f3.5) unless I up the in camera sharpness to +1 or 2. Afterall, it is a zoom and they are known to be softer than good quality prime lenses. In addition, it's sharpness also does not match my old Minolta AF 70-210mm f4 zoom known as the "Beer Can." Though it can come close. Again, unless I up the in camera sharpness to +1 or 2. I am rather impressed with this lens. A great all-around contender. It would be nice if Sigma tweaked its sharpness and transfoms it into an "EX" lens.